While occasional teeth grinding may seem benign, those who suffer from regular bouts risk damaging their teeth and jaw, among other health complications. When we’re under strain or feeling worried, our muscles tense and our heart and breathing rates increase. Many of us also tend to clench our jaws and grind our teeth. What Does it Mean When You Grind Your Teeth? You’re probably stressed. 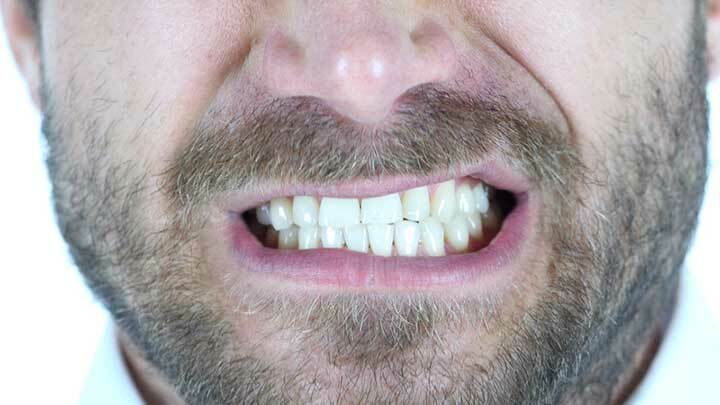 While there’s no single definitive cause of bruxism, Dr. Richard Price, DMD and spokesperson for the American Dental Association, says “stress is number one on the list.” Following close behind, he says, are anxiety, frustration, [and] anger. When we’re under strain or feeling worried, our muscles tense and our heart and breathing rates increase. Many of us also tend to clench our jaws and grind our teeth. Sleep disorders, most notably sleep apnea, are also causal factors. Other teeth grinding triggers include loud snoring, certain medications (especially anti-anxiety drugs), heavy use of alcohol and illegal substances, smoking, and drinking caffeine. Underlying psychological issues such as depression and eating disorders can also be to blame. While many experts have blamed abnormal bites (i.e. when your teeth don’t meet in a natural place) for bruxism, this theory has been disputed lately. One of the more recent bruxism treatments is Botox. A study in the Journal of Oral Rehabilitation found that Botox minimized symptoms and reduced the intensity of teeth grinding. Dr. Price’s opinion on the wrinkle-eraser: “If it works, give it a whirl, but only with someone who knows what they’re doing. I’d probably see an oral surgeon,” he says. To learn more about Botox, read our post What is Botox? A dentist is the best person to diagnose bruxism. Comparing your medical history, symptoms, and physical exam can lead her to determine whether you’re a grinder. “When teeth grind together, it will cause a wear pattern,” says Dr. Price. That’s often an easy thing for a dentist to notice, as are chipped, loosened or fractured teeth. To take an even closer look, some dentists take a mold of the teeth to study the wear patterns in more detail. “Teeth clenching is more common during the day, which can lead to tooth grinding at night,” says Dr. Richard Price, DMD. The reason: possibly because we fall into deep, REM sleep and our muscles relax, leading our jaws to slide instead of clench, he explains. Each case of bruxism is unique, so it’s important to determine an individual treatment plan with your dentist. Once you’ve been diagnosed with bruxism and have discovered the triggers behind your teeth grinding, the dentist will choose between three types of treatments: dental (i.e. a mouth guard), pharmacological (i.e. medications to treat anxiety or muscle relaxants to relieve tension), and psychobehavioral (e.g. meditation, psychiatric therapy, and hypnotherapy). Wearing a soft occlusal splint (a.k.a. mouth or bite guard) is one of the most popular and effective treatments for teeth grinding, especially when you’re stressed, found Indian researchers. In a study of 20 people who suffered from bruxism, they found that 70 percent experienced decreased cortisol levels (a marker of stress) after wearing a splint. If your bruxism is caused by a sleep disorder, seek help from a medical professional. Also, read our post, Think Natural: Cures for Insomnia for tips to help you get to sleep and stay there. alcohol, anti anxiety, anti anxiety drugs, anxiety, anxiety drugs, apnea, arthritis, caffeine, chronic headaches, common sleep disorders, cortisol, cures for insomnia, dentures, depression, earache, ears, exercise, headaches, health, insomnia 2, jaw pain, loud snoring, massage, meditation, mold, muscle, natural cures for, pain, rem sleep, sleep, sleep apnea, sleep disorder, sleep disorders, sleep medicine, smoking, snoring, stress, tinnitus, tmj pain, treat anxiety.